For most Californians, a vehicle is not just a mode of transportation. Automobiles are an investment, a daily asset, and a necessary tool that many rely on. This is why it can become a major headache when those minor cracks and dings begin to crop up the windshield or other pieces of auto glass. For those that have had enough of unsightly and unsafe auto glass, there is now a great solution. Los Angeles auto glass repair is now easier and more affordable than ever as one of the most trusted local companies, PG Auto Glass, is offering a 10% discount on all of their services. Replacing auto glass is a tough choice for many and it almost seems inevitable that every driver is going to need to do it at some point. Whether it is a flying piece of concrete coming off a street that is in disrepair or debris that has fallen off of a truck on the freeway, the chances of this minor accident happening is very great. PG Los Angeles auto glass replacement and repair offersaffordable services for repairing damaged auto glass, and replacing glasses that are damaged beyond repair. Those that have decided to ignore their damaged windshields may be in for a surprise in the near future. Small cracks and dings can elongate through jostling, moisture, or daily temperature changes. What was once a minor problem could quickly become a dangerous instability in the vehicle. Luckily for those in Southern California, a 10% discount on mobile auto glass repair is making this decision more convenient than what many ever thought. 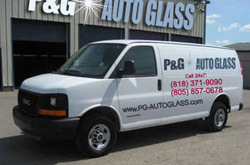 PGoffers auto glass repair in Los Angeles and many of the surrounding communities. For over 10 years, this trusted company has been carrying out mobile auto glass replacement and repairs at the convenience of thousands of satisfied customers. Their fleet of service vehicles can make on-site repairs or replacements with high quality parts 24 hours a day, seven days a week.